The Universal Portable Battery Pack from Respironics' line of DC accessories, provides the ultimate in power, portability and convenience. 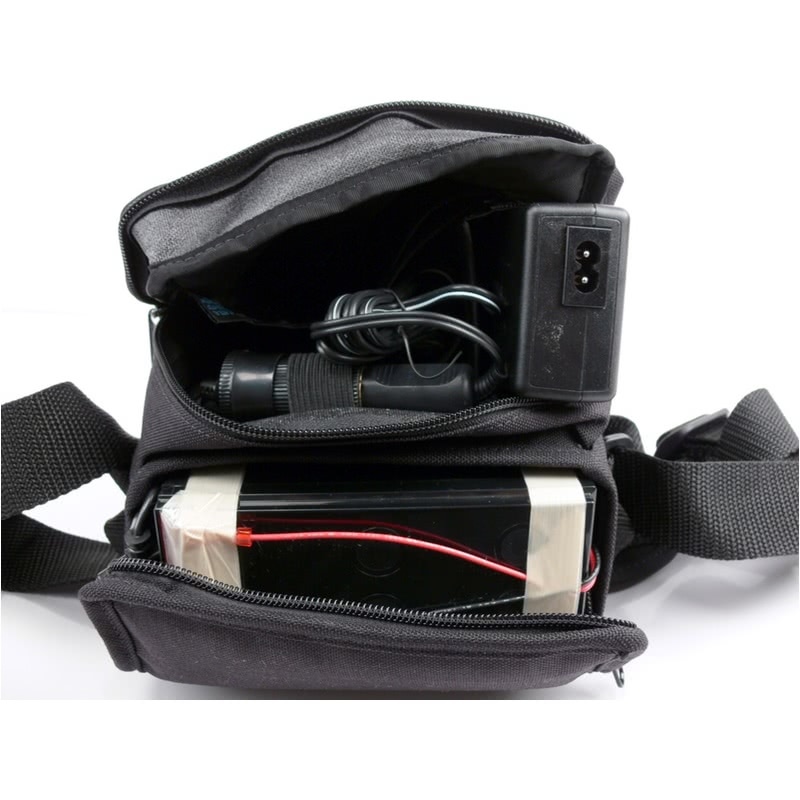 This kit is designed to work with the S8 ResMed VPAP Auto 25, VPAP Malibu & VPAP ST machines. Please see below for the list of compatible machines for this battery kit. The Respironics Battery Kit for S8 ResMed VPAP Auto 25, VPAP Malibu & VPAP ST Machines is for use with the S8 ResMed VPAP Auto 25, VPAP Malibu & VPAP ST machines. 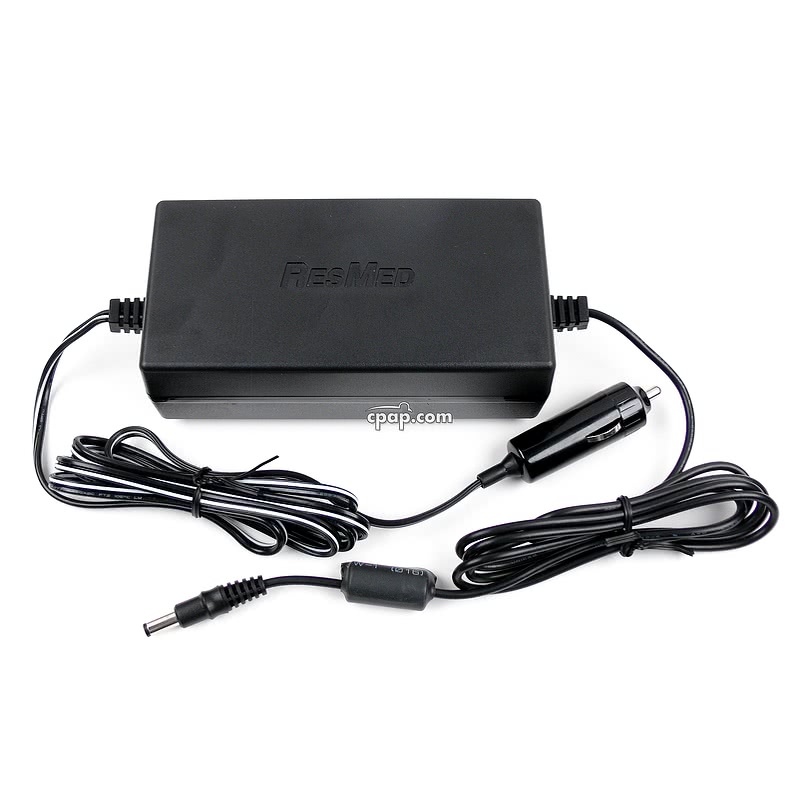 Switch Mode Charger: The 12V, 2.3A charger is designed to effectively charge a sealed, lead-acid battery while protecting the system from overcharging. NOTE: Remove the charger from the carry case PRIOR to charging the battery. Do not charge the battery with the charger in the carry case. The Respironics Battery Pack must be charged from an AC source. Universal Voltage Input of 100-240 AC: The Respironics Battery Pack can be charged with AC current between 100 - 240V. This provides reverse polarity and short circuit protection. RED: Connect the charger to the battery, then connect the wall outlet plug into a wall outlet. Watch the LED light when plugging in the charger. The LED light will turn RED once plugged into the wall outlet. The RED light indicates the charger is correctly connected to the battery. The light may be RED for only a short time before it changes to orange. ORANGE: During normal operation, the LED light turns ORANGE when the battery charge is 80-95% charged. GREEN: The LED light turns GREEN when the battery is fully charged. Disconnect the battery from the wall outlet and charger when the LED light turns Green. Charge Time: Charging the battery from 0 (zero) to a full charge takes approximately 10 hours. If the battery has residual power stored, the charge time will be shorter. The battery MUST BE in the upright position during charging and use. Remove the battery from the charger once fully charged. Fully charge the battery before use. The battery should be fully charged before being stored. See the Specs Tab of this product page for more information on storage and usage. Shelf Life: The Respironics Battery Pack has a charge shelf life of 6 - 9 months. Charge the battery fully prior to storage. The optimal temperature for storage 77° F. As the battery sits there will be a self discharge of power, with less residual charge as time passes. Do not allow the charge level to go below 20% - 25%. See the Specs Tab of this product page for more information on self discharge rates. Estimated Run Times: Please see the "Machine Pressure and Battery Performance" feature below to estimate the battery run time for your machine at your pressure setting. Using a DC capable heated humidifier on a 12 volt battery power source will significantly reduce the amount of power provided. In most cases, battery run time is reduced to less than half the estimated operational time. Some older heated humidifiers will not heat with a DC power source and will instead act as a cool passover humidifier. CPAPs or BiPAPs requiring inverters reduce the power time even more. Charger Cable Length: 67" Approx. Battery Life: A Sealed Lead Acid Battery does not have an estimated number of times it can be charged. When the battery no longer holds a charge, or there is a decrease in capacity, discontinue use of the battery. To maintain the health of the battery, fully charge before storage in a cool environment, optimally 77°F. Disposal: Sealed Lead Acid Batteries should be recycled and should be taken to a location where automotive starter batteries are accepted. This battery kit comes with the Respironics battery and the DC-24 Converter for ResMed, the cable needed to power the S8 VPAP Auto 25 and ST models. The battery must be in an UPRIGHT POSITION during use and while charging. User Manual: To view the Respironics Battery Pack manual, click HERE. This document holds a print date of 08/28/2009. It may provide information meant for older machines, please read through this important tips tab for current warnings and specifications. Remove the charger from the front zippered pouch of the carry case. Plug the 12V power adapter (cigarette lighter adapter) of the charger into the 12V DC power port attached the battery pack. Plug the power cord into the adapter. Plug the power cord of the adapter into a wall outlet. WATCH the light on the charger when it is plugged into the wall outlet to ensure it turns RED, even if it is RED only briefly. The RED light indicates the charger is correctly connected to the battery. The light may be RED for only a short time before it changes to orange. ORANGE: During the normal charge operation, the LED light turns ORANGE when the battery charge is 80-95% charged. GREEN: The LED light turns GREEN when the battery is fully charged. Disconnect the battery from the wall outlet and charger when the LED light turns Green. Store the charger and cord in the front zippered pouch. It is recommended to maintain a minimum charge 20% to 25%. Fully charge the battery prior to storage. Partially charging the battery occasionally will not cause harm to this lead acid battery. If the AC charger should be lost or fail, a new one can be purchased. 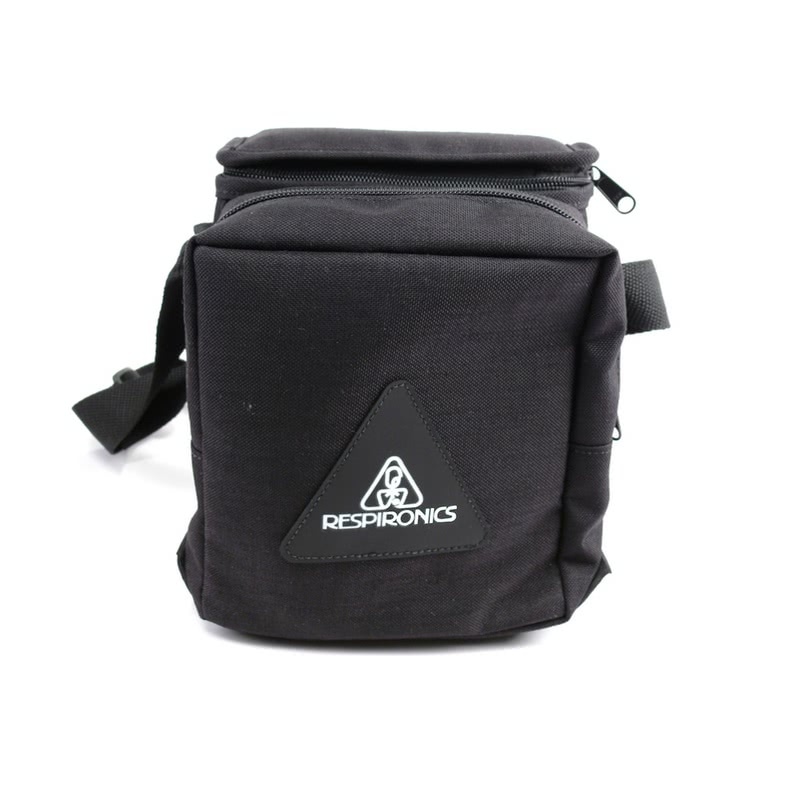 Visit the Battery Charger for Respironics Battery Pack page to view and order this item. 400 Watt Minimum DC to AC Inverters: The Respironics battery must be charged from an AC source. Charging the battery pack from a direct DC source is NOT recommended. An inverter converts DC power to AC power. The AC power can be used to charge the Respironics Battery Pack. The inverter must be a minimum of 400 Watt. Consider the 400 Watt DC to AC Power Inverter. 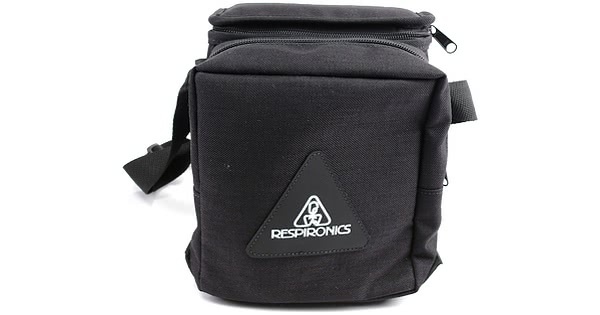 Air Travel: The Respironics Battery Pack uses a sealed, lead-acid battery, which are allowed as carry-on luggage by the FAA and TSA. In-flight use will be determined by the airline and should be contacted on an airline-by-airline basis. Preparing For Travel: We suggest purchasing the battery pack far enough in advance so the battery can be tested with the your CPAP machine. This allows you to determine the actual run time using the machine at your pressure setting. Additionally you can test whether or not heated humidification is required for your comfort. For optimum performance of the battery pack, plan to use the CPAP without a heated humidifier. Alternately, connect the humidifier but do not turn on the power. Add water to the chamber as usual and the humidifier will act as a passover, non-heated humidifier. Using a heated humidifier on a 12volt battery power source will significantly reduce the amount of power provided. In most cases, usage is reduced to less than half the estimated operational time. CPAPs or BiPAPs requiring inverters reduce the power time even more. Please note that some heated humidifiers are not capable of being operated on 12volt battery power sources. PR System One and PR System One 60 Series heated humidifiers will heat and will draw significant battery power. The M Series heated humidifiers with the 6'' 'pigtail' connectors are capable of running on 12volt DC power sources. Earlier model M Series heated humidifiers without the pigtail are not 12Volt capable, nor are the Legacy model REMstar and stand-alone H2 humidifiers. The older non-DC capable humidifiers will act as cool passover humidifiers and will not heat. DO NOT store the battery in a very hot environment such as a vehicle in hot weather, in direct sunlight or near a heat source such as camp fire or stove. The battery may corrode, ignite or create an electrical shock hazard. The battery MUST be in an upright position during charging and use. Remove the charger from the carrying case BEFORE charging the battery. DO NOT drop the battery or strike with heavy objects. Damage or deterioration may result from dropping or striking. If the battery leaks and the gel spills on the skin or clothing, IMMEDIATELY wash it off with plenty of water. If the gel comes in contact with your eyes, immediately flush your eyes with plenty of clean water and seek medical attention. Use the battery in a well ventilated area. Replace the battery if it fails to charge or you notice a decrease in capacity. Inspect the power cord for signs of damage. Discontinue use and replace the charger (enclosure of cord) if it is damaged. Do not underestimate the weight of the battery. Battery Fuse: To ensure proper operation of your battery, use a 15A fuse only. Some older heated humidifiers will not heat when using DC power. They will instead act as a cool passover humidifier.